When Dubai was declared as the host for the Expo 2020 in November 2013, it gave the entire GCC an opportunity to showcase and explore the possibilities of new ideas and people connecting through one platform. Through its unique theme of Connecting minds, Creating the Future, the expo aims to provide a platform to foster creativity, innovation, and collaboration. The idea is underpinned by three interwoven themes addressing the pressing issues, which include Opportunity, Mobility, and Sustainability. The 438ha main site for the Expo has been masterplanned by the American firm, HOK, and is organised around a central plaza, titled Al Wasl, enclosed by three large pavilions, each one dedicated to a sub-theme. In March 2017, Dubai-based contractor, Al Futtaim Carillion, was awarded the main contract for the development of the three theme districts. When Expo 2020 Dubai opens on October 20, 2020, the theme districts will be home to 136 pavilions for many of the participating countries, non-governmental organisations (NGOs), and commercial partners, to host exhibits and experiences for the millions of expected visitors. One of the three petal-shaped thematic district at the Expo 2020 site, dedicated to the subtheme of Opportunity, will house 33 pavilions, including assisted, rented, and service ones. 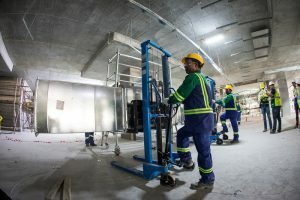 Dubai-based mechanical, electrical, and plumbing (MEP) contractor, ASU, was awarded the job and started working on the project from December 2017. The Opportunity District project consists of a huge basement, with a total surface area of around 54,000sqm. Above the basement, there will be 33 buildings, which will be called Pavilions. The basement is being built for all the services, utilities, and servicing the Pavilions and all other surrounding areas. The same will also be useful for future expansions. The project taking-over certificate for ASU is planned in April 2019, which according to the company, is a [very] squeezed programme. The contractor had to do a lot of preparation works on site before the construction commenced. All activities are being conducted in parallel, including engineering, procurement, and construction at the same time. Massive and precise co-ordination is needed and huge manpower just to conclude all this together, says the company. ASU believes that working on the project as one team will help the main objective to finish on time since these are prestigious developments for the country and there is no chance of delaying it even for a day. The contractor is currently ahead of schedule and has had around 10% progress on site, but in terms of shop drawings, ASU has seen around 75% progress, and in terms of material ordering and procurement, they have 47% progress. The progress increases day by day based on the lifetime of the project. ASU workers working on site. ASU has deployed around 100 workers on site currently, and in the peak time, it is expected to exceed based on the requirements of the works. The company believes that the main task is to increase efficiency on site, and for that, the areas have been split between all the trades so not to be jammed at one place. One of the aspects that ASU is focussing on is that they are thoroughly looking into the design and engineering issue for materials and approvals themselves, since the contractor doesnt want to depend on the official transmission of documents because that will entail waiting for 14 days for review and commenting. Hence, ASU conducts condensed workshop meetings, on a daily or a weekly basis, with its engineering team, consultant, and client, so that they are able to expedite and get the approvals in advance. This helps in continuing with the drawings submissions and the material ordering as per schedule. In addition to it, ASU is also using the most recent technologies like building information modelling (BIM) in the drawings and drafting. A high-tech software is used which demands skilled labour and team. ASU already has a separate team specialising in BIM working on the same, so that it helps a lot in the engineering and the construction side. The MEP contractor is using something akin to a laser surveyor, which can absorb and upload the drawings in a CAD format on a robot surveyor and it can automatically read the drawings. It can also mark and highlight the places and locations of the services so that the engineers can carry out fixation and supporting systems based on that. Most of the fabrication are done out of the site by ASU. This is also to avoid any safety problems and to enhance the progress on site. So, the MEP contractor conducts most of the fabrication in factories. The contractor has reserved places for its workshop, equipped with all kinds of certified tools and machinery. Minor fabrications are done onsite. 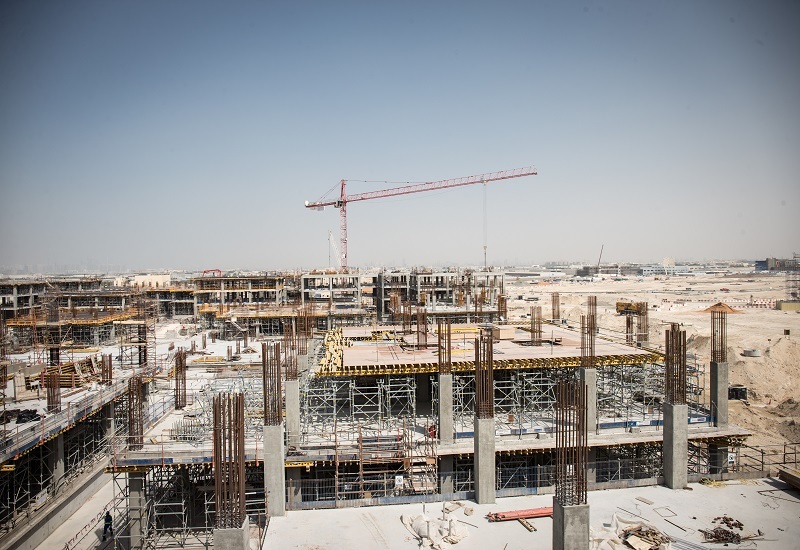 One of the targets of the Expo 2020 project is that it wants to increase the standard of construction activities in the region, including in terms of how the contractor is dealing with the workers, accommodating them in the camps, providing them safety and protection while working onsite; all this lies under the regulations. The welfare regulations have a lot of standards to meet regarding how the workers should be mobilised, furnishing the camps, and many more. This is in line with the vision that it will be implemented in all future projects. Based on the regulations on site, 25% of the materials and power consumption must be from recyclable and natural resources. Following the same, ASU reuses water and reduces the wastage of water and chemicals. The company has very strict rules in terms of waste recycling, welfare for camps, which comes under the sustainability or the LEED requirements. The contractor aims to achieve the LEED requirement of GOLD and according to the company, it depends on how far the rules of the sustainability requirements are followed and met. So far, ASU hasnt faced any loss time injuries (LTIs) on this project. The company follows strict rules in terms of safety. One of the most important aspect for the contractor is to have high levels of health and safety (HSE) and it needs to be put completely separate from the project management control. ASU sends its HSE reports directly to the top management in the company. The company also conducts regular trainings for HSE and constantly updates everyone about new standards and regulations. Specialised training is also provided to the staff and labourers in terms of fire and safety. Waste control is an important aspect; hence ASU splits the waste into two – hazard waste and normal waste. The company employs specialised subcontractors to deal with the waste and treat them. Designated places to dump the waste has been allocated on site and on a weekly basis, a special truck arrives to collect it for recycling.